Have you ever been to a nice hotel (4 star or more), and took a shower there. In most cases, they have a very beautiful setup with multiple jets coming at all different directions. Chances are, they used a system like this. What we are reviewing here is Blue Ocean SPV87839sH luxury shower panel. This is classified as a mid tier system that enables regular people like you and me enjoy a higher quality shower. When I came across this system in particular, I took notice of the important specifications, what others thought of it, and the current regular price. You may assume anything with the world "luxury" in it would qualify as an area where you can "go all out". But even here, an "affordable" luxurious shower panel is more desirable, especially when it has all the right attributes. So here's what to expect below as you read the review of this shower panel by Blue Ocean: I'll talk about the primary features and what each thing does, how you'll benefit from the most important features, and also to be fair, how some of things may make you suffer. Want To See Shower Panel Systems? Features, the things which can make something that looks bad, good. Also, vise-versa. Today, we are going to cover all of Blue Ocean SP2392H's features that actually matter. 8 Mini Jets, 1 Overhead Rain Shower and 1 Handheld Wand: By far the biggest advantage with this unit is its ability to give you a FULL BODY shower from head to toes. Measuring a total of 52" inches, you can mount it about three feet from the ground, and when completely installed, have the ability to turn on either the main rain shower head at the top, a handheld wand for more personalized showering, or all of the 8 water jets located on the sides. You can control all water outlets and with some settings, you can have multiple outlets running at the same time. LCD Temperature Display: I am willing to bet YOUR shower, does not have a way for you to tell how hot or cold the water is. While you can take a guess, in some cases you could be way off. What you get here is a built-in LCD temperature display. When you turn the water on, no matter from which outlet, you'll know exactly the number. This could be quite useful when you're just getting ready to take your shower and not you clearly don't want to get shocked by super cold or hot water. KNOW, before you ever step foot inside the shower room. Get Rained On: While I mentioned earlier you get a total of 10 different water outlets to choose from, well one of them that I think is a great feature is the above shower head. Being mounted to the extension arm, this perfectly square rain head lets you enjoy a soothing flow of water as you stand there. Using the LCD display to adjust the temperature, you can with 100% certainty know what your ideal number is. Keep in mind that because the entire system is setup to be running from one flow of water, as you turn ON the top section and turn OFF everything else, water pressure will go up a little. Seven Different Spray Settings: While you may look at this entire system and see only the handheld wand that has selectable spray settings (and it does, 4 of them to be exact). However the other ones TOO have different spray settings. Let's get the top section out of the way as it only gives you steady flow rain. Where there's two other settings are on the 8 individual water jets, choose from mist and a higher flow spray jet. When you count everything up, there's a total of SEVEN you can enjoy. You gotta know how what I mentioned above will benefit you, so here's a list of advantages I put together. Personal 4-Star Hotel Experience: For the cost of just one night in a 4 star hotel, you can have this shower panel. Sounds like a bargain right? That's because it is. The days of your old and boring single shower heads are long gone, it's time to spice things up with a more exciting layout. 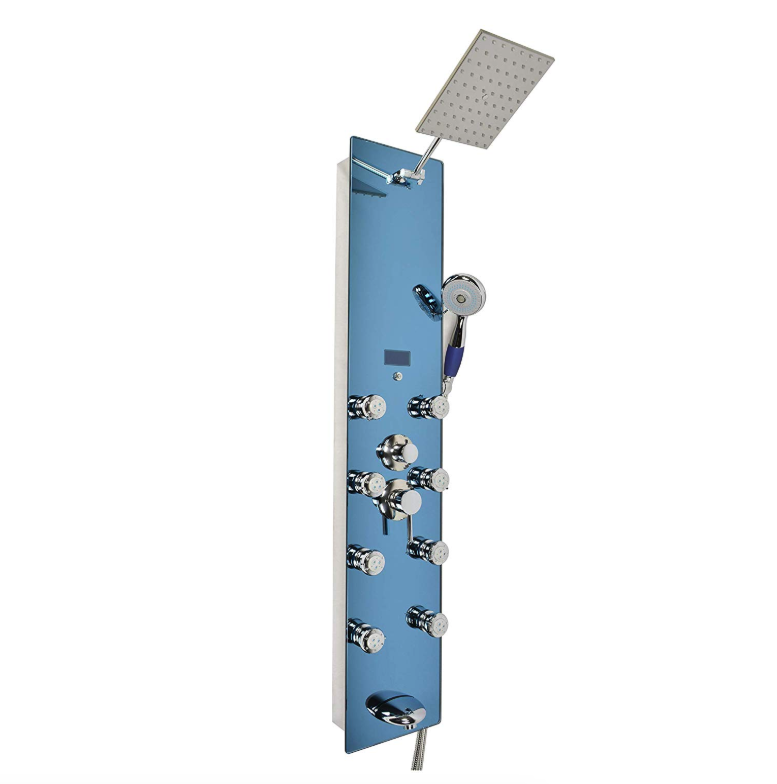 What the Blue Ocean shower panel offers is being able to clean yourself from all angles. In addition to that, you can get to angles that even the most sophisticated shower heads cant reach... thanks to the handheld wand. This is a true joy and something I think you'll feel the same way about! You Can Have More Options: Connecting to the features mentioned earlier, I'd say with this unit you get more options. It should seem quite obvious that you'll go from having a boring single mounted shower head (or at best a dual outlet one), go something that resembles a luxury bathroom in all respects. You get that amazing rain shower, 8 powerful jets, and something to get to those hard to reach places. THAT, is what I call having real options. You don't need to compromise, but instead just have everything you in just one mostly simple package. You Get A Nicely Built Product: Just look at it, this thing looks quite nice with the stainless steel sides, a reflective mirror, and a flexible metal hose. Everywhere you look, it looks quite sharp. Now this may just be from good pictures taken by Blue Ocean, but even when looking directly at others that were taken by regular users... it appears to be well built. So you may be wondering what are some drawbacks, especially after everything that I've said about it. There are a few, so I'll list them down in order. Shower Jets Work Individually: One thing I wish this shower panel did was let you use all 8 shower jets at the same time. Unfortunately, only one at a time can be operated. Which is unfortunate, given how much more enjoyment a user would experience. But I also understand that the water pressure would drop significantly if going through all eight. Temperature Display ONLY Shower Celsius: For some of the western world out there, being able to just read the temperature setting in celsius is an inconvenience, since most only know Fahrenheit. An extra button that lets you select between both, would be ideal. So what do you think about this beautiful shower panel? I personally love it and will buy it at the near future (Christmas time probably). My bathroom is the perfect place for it because the shower is actually an enclosure. From all directions water will come from, my setup is perfect for it. If you enjoyed this article, could you please share it with anyone you know. There's buttons located at the bottom that let you spread the word. Also, if you have something to ask or just say, leave a comment below and me or my wife will be sure to read it.